This shop has been compensated by Collective Bias, Inc. and its advertiser. All opinions are mine alone. 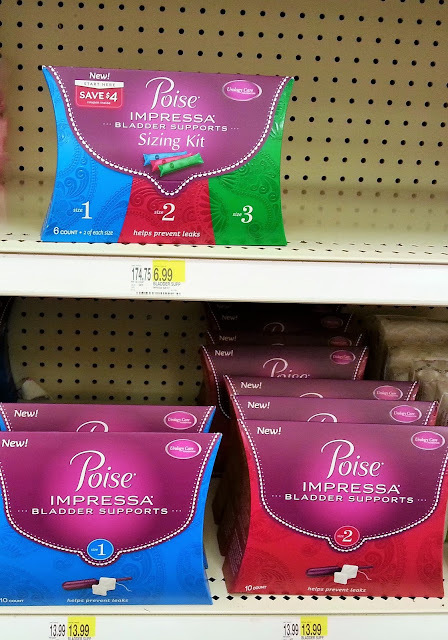 You must be 21+ years old to try Poise Impressa Bladder Supports. Having 4 babies, regardless of how they were delivered has done some damage to my body. You know what I'm talking about, Stress Urinary Incontinence ( SUI ). Those times when you may laugh a little too hard, sneeze, or exercise and uh oh, you feel a little leaking. It's very embarrassing and downright annoying to be quite honest. It happens anywhere at anytime. 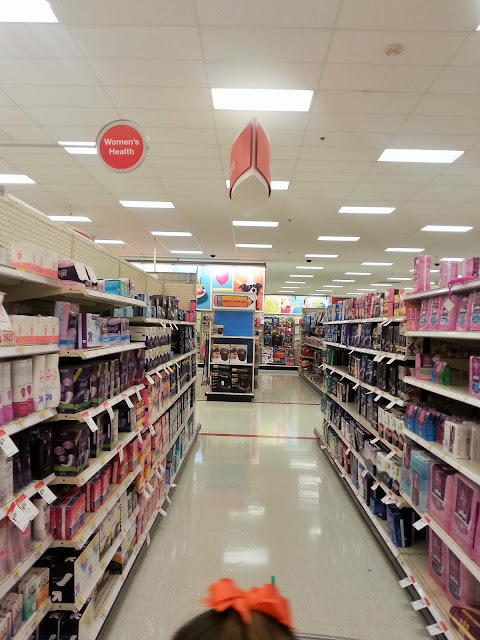 During one of my frequent trips to Target, I came across Poise Impressa Bladder Supports and had to find out more. What are Poise Impressa Bladder Supports you ask? They are a revolutionary new product designed to help stop those embarrassing and annoying leaks before they happen. Where have these been all of my Mommy years?! The Poise Impressa Bladder Supports look like a tampon, however they don't absorb leaks they prevent them, yes I said prevent! There are 3 sizes of the Poise Impressa Bladder Supports and you should purchase the sizing kit to help you find the size that fits your body. Step 1: Start with size 1, insert the Bladder Support just like you would a tampon. Step 2: The non-absorbent Bladder Support expands to support the urethra once inside. Step 3: If you still experience leaks, then progress to size 2. Repeat until you've found your perfect internal fit. Step 4: To remove, pull on the string and dispose of the bladder support in the trash. The unique design allows you to go to the bathroom normally without removing the support. After using the Sizing Kit to discover your perfect fit, you can advance to a 10-count pack with the size that best suits your needs. A soft flexible, internal device with a non-absorbent outer cover, designed for the temporary management of SUI. I found that a size 2 works best for my leaks and helps keep me protected during the day, especially when working out. The sizing kit includes 2 of each of the 3 sizes so you can find the right fit. You should start with size 1 and work your way up to size 3 if you find yourself still having leaks. Size is determined by the best internal fit for you, not by weight or how much you leak. 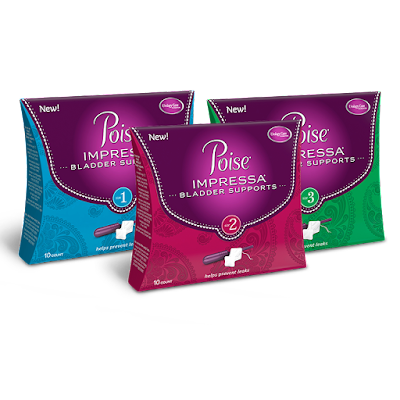 If you have a sudden urge to urinate, Poise Impressa is not for you, instead you should try the Poise liners and pads for urinary incontinence. You also should not use Poise Impressa if you are pregnant or on your period. I love that I can wear Poise Impress for up to 8 hours during a 24 hour day and not worry about having to remove every time I go to the bathroom. I can now laugh, exercise and sneeze without worrying about leaking. 9 out of 10 women have found that their bladder leakage was reduced and even stopped after using Poise Impressa. 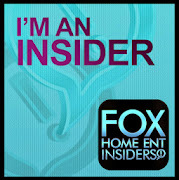 You can read some testimonials here. I am so glad that I no longer have to worry about leaks during my usual workout or laughing at my kids thanks to Poise Impressa Bladder Supports. Would you give them a try?